Sergey Shipov struck a blow for chess commentators everywhere by winning a handicap blitz tournament in Moscow, finishing ahead of Grischuk and Morozevich. 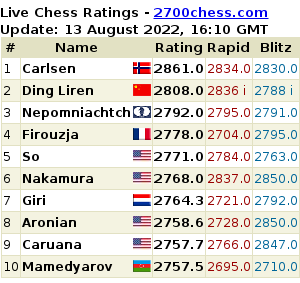 The games lasted 22 minutes and Shipov explains that they divided the players into groups – R1 was 2700+, R2 2600+ and so on. If you played someone in the same group you both had 11 minutes, in adjacent groups it was 12 to 10, then 13 to 9 and so on. 1st round: white – Shumilina. A lucky win due to the misplaced shyness of my opponent. 2nd round: black – Grachev. I only barely survived. But it seems to have been a fair reflection of the play. 3rd round: white – Korotylev. A wildly lucky win, accepting a queen blunder. The worst game of the tournament. 4th round: white – Malakhov. I won amazingly easily and quickly. I even liked it myself. After my opponent made a typical mistake coming out of the opening I went on the attack and crushed him. 6th round: black – Bareev. I took the life out of the game and drew without trouble. 7th round: white – Inarkiev. As always my opening was mediocre, but then I counter-attacked sharply and my opponent lost his way in the complications. 8th round: white – Grischuk. In the opening I sacrificed a pawn for the initiative, then won it back and attacked, my opponent ended up in terrible time trouble (one minute to five), but seeing that the position had equalised and TV cameras were on hand I didn’t try to flag him. Wuss! In general I played quickly and incoherently. As it turned out – the best strategy!